You either love them or you're intimated by them... we're talking Palazzo Pants! It may take a little minor tailoring to get the perfect fit but Palazzo Pants look great on just about any body type! 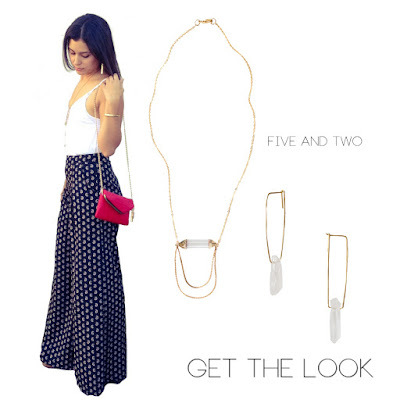 Try our Penny Palazzo Pant paired with a cropped tank. They're great for summer because they're so comfortable, you'll feel like you're in pajamas! Who doesn't love that? We added some crystal quartz jewelry by California based jewelry designer, Five and Two. The Zion Necklace is a favorite! This piece is the ideal necklace, not too loud and not too understated. Add some bling to your ears with the Iris Quartz Earrings and you're set for a fine summer day!